Wow. We are back here for a FOURTH year for Fortnight of Fright and I can hardly believe it!! As many of you know, September – January is my very favorite time of year and Halloween is my one true love! 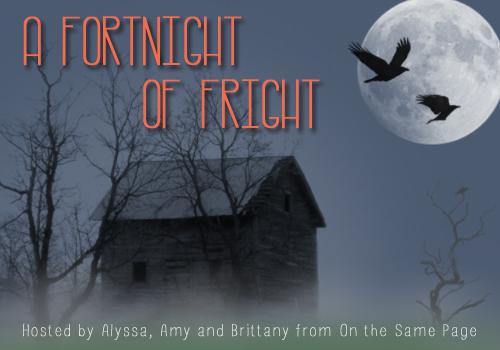 Therefore, it is no question that Fortnight of Fright is something that I love hosting along with Brittany (The Book Addicts Guide) and Amy (Tripping Over Books)! Sign ups will be open from 9/9-9/20 and you will be notified the following week to confirm your post topic, and so on. We are going to ask that all posts get to us the week of 10/12 as we will be hosting you during the event which runs from 10/19-10/31! As always, the more the merrier, so scroll on down to our Google Doc and sign up to help us out! This entry was posted in Event, fortnight of fright and tagged All Hallow's Eve, All Hallow's Read, Authors, beyond books, bloggers, books, creepy, event, Fortnight of Fright, ghosts, Halloween, paranormal, scary. Bookmark the permalink.